One of the hidden gems of Jogja is, of course, the many secret beaches that only you and Wikimapia know about. The beaches in Gunung Kidul, the mountainous area east of the city, are mostly white sand with steep limestone cliffs all around. Swimming can be dangerous all along the south coast of Java and it is definitely worth remembering that the rip currents can be pretty strong. A good place to start exploring these beaches is a little white sand beach called Wohkudu Beach — go ahead and look it up on the map. On a weekday most beaches in Gunung Kidul are empty of people. During weekends a few of the popular beaches near Krakal and Baron can be busy where they serve fresh seafood and provide facilities. This truly spectacular view is free, but only if you stay on the ground. At Parangtritis there is a mile-long black sand beach with 656-foot-high cliffs over the eastern part. That is where the brave throw themselves off the edge and into the thin air above the beach and its ferocious waves. They are paragliders, not base-jumpers, and a tandem flight will only set you back $30 for a memory for life. If you need a break from the immense view overlooking Parangtritis Beach, you might want to climb down to the sacred meditation cave, the Gembirawati Temple, in the midst of the cliffs. A tropical Eden and seven families! You don’t want to miss out on seeing the real countryside, the Javanese Eden, in Yogyakarta. A couple of great places to do this are Puncak Suroloyo and Gunung Api Purba. At Suroloyo Peak the sunrise provides a totally surreal scene of drifting fog and jagged landscapes with Borobudur temple at your feet. On the top of the 2,296-foot-high volcano Gunung Api Purba on the other side of town, there is a peculiar and very traditional village with an odd cultural rule — only seven families can live in the village at the same time. The volcano Merapi erupted last in October 2010. It was spewing volcanic ash 16,404 feet into the atmosphere. It was snowing ash far into Jogja City and air traffic was shut down in large parts of Southeast Asia. Now, you can go up to Kaliurang and get truly impressed by the people’s sheer will to survive and the power to get back on their feet. 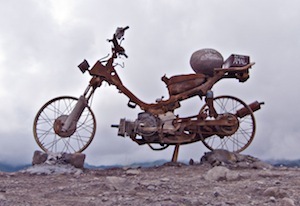 Not without a sense of humor, the villagers of Dusun Kinahrejo have made a monument of a motorbike that was torched by the pyroclastic fireball during the Merapi eruption. While still easily spotted, the cold lava is now being straightened out and planted with trees and vegetables and it is really amazing to see how things revive against the backdrop of Merapi itself. To round off a good day, Jogja has a tradition for hanging out streetside. 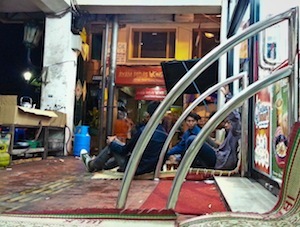 Many areas have spots for hanging out until late night in makeshift kiosks that pop up after dark. Popular places to sit on the sidewalk are a mini-mart in front of Bintang Cafe in Sosrowijayan, where it can get quite lively on a Saturday night, and the Prada in front of Circle-K on Malioboro Street. This is where you can have a snack and a nice chat with perfect strangers before going home — and early up the next morning for new adventures.